Though it isn't the blitz voters will be subjected to this fall, one June primary election is bringing political mailers to Elk Grove mailboxes. That race is for the Area Six seat for the Sacramento County Office of Education. That seat, which is being vacated by John Scribner, is being sought by Heater Davis, Orlando Fuentes, Jrmar Jefferson, and Stephanie Nguyen. With Scribner leaving the seat, the position has not only attracted four candidates, it has taken on higher visibility. The most visible candidate so far has been Heather Davis of Elk Grove. To date Davis has sent two mailers and another one on her behalf from an independent committee. 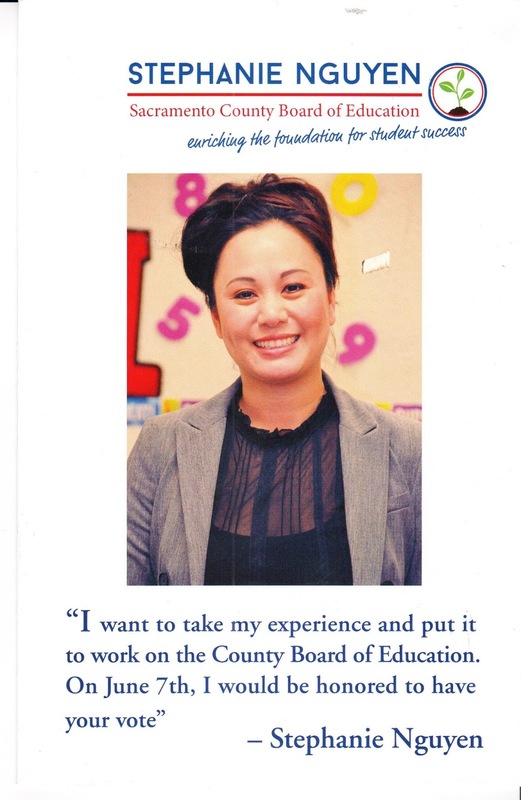 While Davis has initially jumped ahead of her competitors by dropping her first mailer last week and another this week, Nguyen, also of Elk Grove, has jumped into the fray. Yesterday a mailer that appears to target mail-in voters was received yesterday. To date, no candidate literature has been received from the Fuentes and Jefferson campaign. The Area Six SCOE district includes all of Elk Grove and southern portions of Sacramento County. With a little more than two weeks until the June primary, Elk Grove voters can expect to see more candidate pieces in their mailboxes. 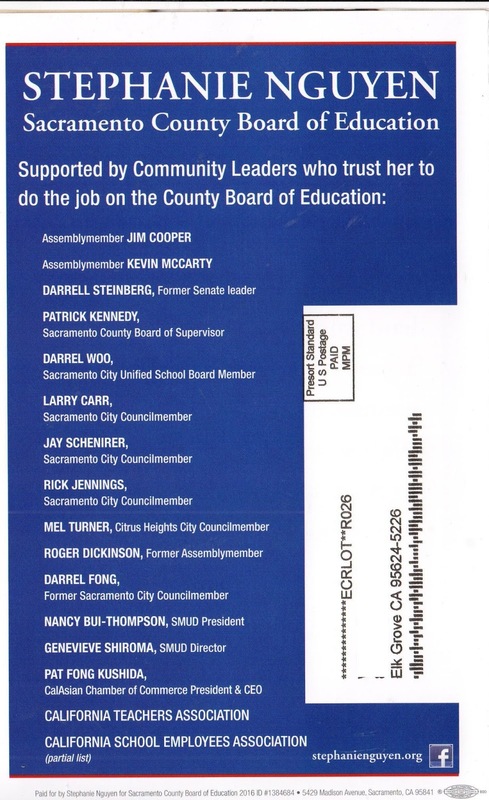 Nguyen's list of endorsements is far more impressive than Davis. For example, Nguyen's endorsements include the California Teacher's Association and California School Employees Association. Let's see Ms. Charter School top that since charter schools are notoriously anti-union. Jim Cooper also endorses Nguyen--guess that colossal abandonment of Nancy Chaires for Council is coming back to haunt Gary Davis.